Founded in 1986, UK-based Hi-Grade produces laptops as well as digital home entertainment technology. 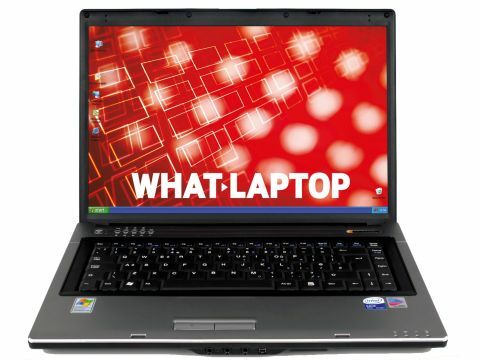 Offering an affordable and mobile entry-level multimedia laptop is the Hi-Grade Notino D7000-2000 (£999 inc. VAT). Providing comfortable mobility, the chassis measures just 355 x 239 x 42mm. Its 2.8kg weight is also fairly portable. However, battery life is less capable, running for just 148 minutes, under test. Aiding usability on the move, the chassis slants forwards to a depth of just 21mm when open, placing the keyboard at a natural typing angle. The keys themselves are slightly rigid, limiting comfort, but are highly responsive. Supporting its multimedia design is a 15.4-inch widescreen TFT panel, but without a Super-TFT screen coating, images are slightly dull. However, this suits mobile use, as the anti-glare screen aids comfortable viewing in all light conditions. Despite its small chassis, the Hi-Grade packs plenty of power. Dual-core performance is provided by a 2GHz Intel Core Duo T2500 processor, with 1024MB of DDR2 SDRAM. The Hi-Grade scored an impressive MobileMark 2005 result 238 points, ensuring that the toughest tasks can be handled with ease when out and about. However, entertainment use is where the Hi-Grade is aimed, and its performance is a mixed bag. Powered by an nVidia GeForce Go 7400 graphics chip, 3D power is ideal for watching movies and digital TV, but its 3DMark 2003 score of 3897 won't suit modern 3D gaming. Configured with Windows XP Media Centre, a remote control and USB digital TV tuner come bundled as standard. A dual-format recordable DVD drive can write to high-capacity data discs, and a DVI-out port enables connection to external digital displays. Common to most modern laptops, high-speed networks can be set up via Gigabit Ethernet and 802.11a/b/g Wi-Fi. Providing a full office software suite, the Hi-Grade also includes the open-source OpenOffice application as an alternative to more costly Microsoft options. With impressive power and competent multimedia ability in a mobile chassis, the Hi-Grade Notino D7000-2000 offers plenty for the mobile user. Hi-Grade software bundle: Multimedia users are the target audience for this laptop, so Sonic RecordNow! and CinePlayer software are installed for the creation and playback of multimedia discs. Recognising the role of the Internet in digital multimedia, BullGuard Antivirus protects the laptop online.